What in the world… oh, New Zealand! It all clicked – he was referring to the Tasman Sea, the *ditch* which separates New Zealand from Australia. We had barely been walking for an hour and I was already feeling quite out of breath. Josh was walking ahead of me and had obviously detected some Australian in my accent. There were thirteen of us – a Kiwi, a Frenchman, a Canadian, a Peruvian, two Australians and six Americans. We had all woken up (well, for some of us, it was still “last night”) at a rather ungodly hour to be picked up at 4:30am so that we would get to Mollepata in good time for breakfast and the start of our five day adventure which would take us on a tour of the sacred valley of the Incas, passing through Salkantay pass and finishing at everyone´s favourite Peruvian destination – Machu Picchu. The starting point for all this was, of course, Cusco – the ancient capital of the Incas and now the gringo capital of all of South America. In the ancient language, Cusco means “navel of the world”. Well, this world must´ve had quite a bulge at the belly because this “navel” was over 3300m above sea level. After separating briefly so I could visit Quito, Ecuador and so that Nick could have some time alone in the States to make his decision on which University to do his PhD, we both took the 21-hour bus ride from Lima to Cusco. The first few hours of this bus trip were easy. The bus coasted along the smooth, straight panamerican highway for a few hours before turning off to Nazca, famed for this gigantic line drawings of animals on its plains. After this point, the trip was not quite so smooth. Not only did the road quality deteriorate somewhat, it began to snake through the mountains in a manner that might make one seasick. Luckily, I saw off the combined forces of winding roads and high altitude and managed to hold the two meals that were served on the bus on the inside of my stomach, just. We both arrived in Cusco within a few hours of each other, weary, dizzy and hungry at about midday-ish on Monday 16th of April. We played it safe and decided not to begin our trek until the Saturday to give us adequate time to acclimatise. In the meantime we visited Inca ruins (which were in a surprisingly un-ruinous state) which were conveniently located very close to Cusco, it *was* the Inca capital after all. When we reached our lunch stop after about three hours of hiking, I was beginning to feel like five days of acclimatisation wasn´t enough. I was sweaty and out of breath. The boots that I had rented from Cusco were beginning to slowly cook my feet as well. Our guide, Jose (pronounced hoe-say), explained to us that we had the option of taking the supplies truck the rest of the way to the campsite instead of an additional three hours of walking. How tempting. “Is anyone else taking the truck?”… there was an awkward silence. Oh well, three hours isn´t so bad. This became a very familiar call which we eventually took to mean anything from half an hour to two hours. We reached our campsite for the first night about fifteen minutes short of three hours. This site was perched at the base of an expansive mountain pass which seemed to pass between two magnificent snow-capped mountains in the distance. We all gathered in the dinner tent (which we only actually used for dinner on the first night) and ate popcorn and drank tea while discussing the merits of chewing cocoa leaves while the cooks prepared our dinner. That night the sky was crystal clear, to the point where one could see the Magellanic clouds, previously only witnessed by myself in country Australia far far away from the air and light pollution of big cities. The following morning we similarly clear which, although made the morning chill that much crisper, bode well for hiking conditions for what was easily to most difficult day, the day when we would trek through Salkantay pass, the highest point of our trek at 4600m. I examined my toes after breakfast to find that they were not fit for… anything. 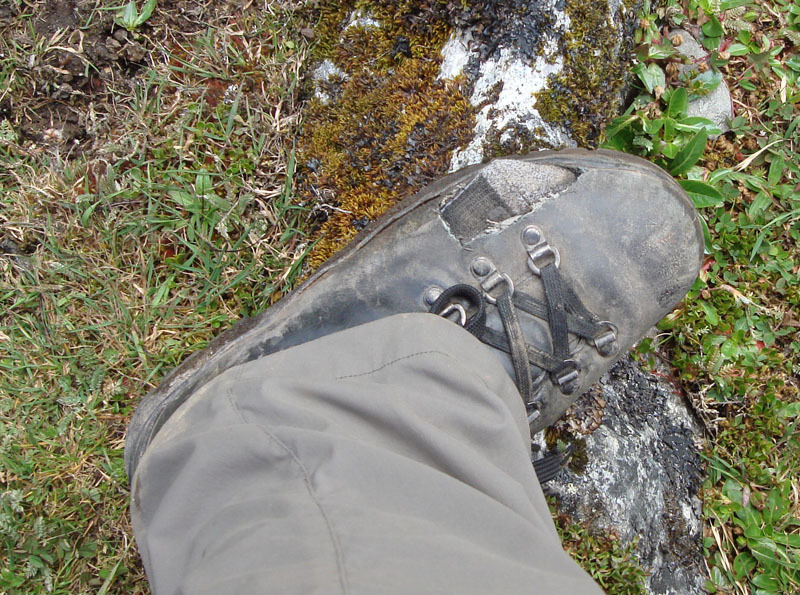 My rental boots, which had fit fine and which I had rented for a day prior to the trek for testing purposes, were pressing on my little toes in a way which caused excruciating pain. There were painful blood-blisters under my toenails and even the slight pressure of putting my socks on ignited a painful response. I might have been able to endure one or two hours of this, but not the ten which were planned for today. I asked around and was evnetually able to borrow a pair of flip-flops which I hypothesised I would be able to tape my feet in much the same way that the ancient Romans did with their sandals. We set off at about 5:30am after a 4:30am wake up call (with a cup of cocoa tea!) so that we could avoid a toll (or maybe it was a troll). I was, however, unable to avoid the damp and muddy ground which surrounded our campsite at this early hour and before long, I was almost knee-deep in mud. Mud in which I nearly lost the flip-flops that I borrowed not ten minutes before. Luckily, someone had their first aid kit with them. A small group gathered around me, fascinated, while I performed minor surgery on my boots. The scissors were small, barely the size of my palm, and getting enough leverage onto them in order to cut the thick leather and lining of the boots was difficult. After about fifteen minutes, my right hand was sore and cramping (from the scissors) and both of my boots had holes in them big enough for all of my little and a bit of my fourth toe to stick out. The boots were instantly much more comfortable. We continued to ascend and the scenery around us began to change. It was difficult to notice because we were beginning to feel the effects of the altitude. The campsite was at 3800m and we were, by then, much higher than that. We looked around, no trees. Before long, there wasn´t very much at all but we were too busy concentrating on the now nontrivial task of placing one foot in front of the other and transferring our bodyweight from the back foot to the front foot. This wasn´t just because of the altitude, but also because the terrain was rocky and difficult. Good thing I had my boots. A little bit after 9am we reached the pass. Still considerably lower than Salkantay itself (6200m) it was high enough to give all of us a bit of a dull headache. After giving each other high-fives and taking a group photo or ten, we continued. Eventually, the horses carrying out supplies passed us. We reached our lunch stop quite early and were ordered to take a nap while the cooks prepared our lunch. This time we were thankful of Jose´s misunderestimation of time as our half-hour nap went for a much-needed hour. Our pace was still above the “norm” as we only trekked for a little over eight hours that day. Most of it was downhill and my thighs never missed an opportunity to remind me of this fact over the next few days. When we did finally get to our campsite, Mark our Irishman asked “where are the horses?”. But his accent was sufficiently thick that one of the Americans turned and looked quizzically… “oooohhhh! HORSES.. I thought you said WHORES”. The next two days were a relative walk in the park. 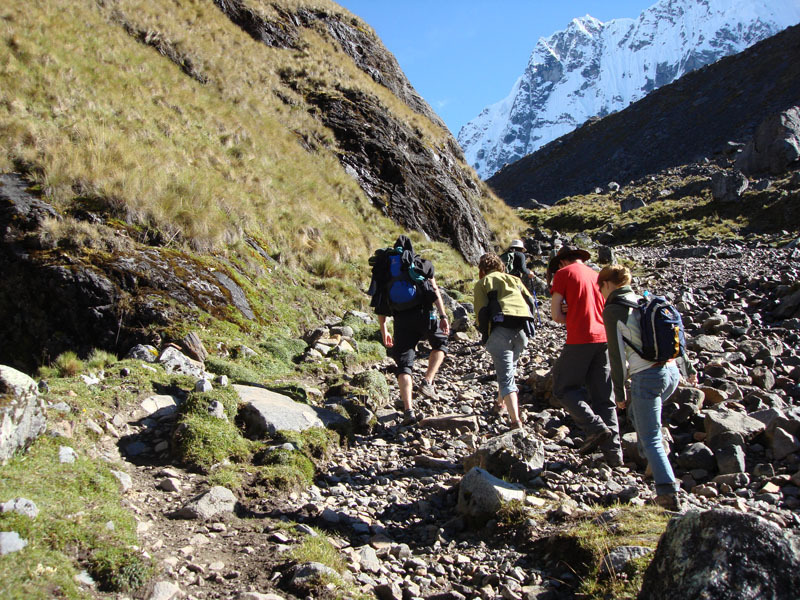 Though we hiked for about six hours on both, the terrain was easy and the altitude was never much over 2000m. On the third day, our progress was severly delayed by the bane of the Peruvian wet season – landslides. After lunch, the plan was to take a bus with our supplies to a campsite at Santa Theresa where there were hot springs. Unfortunately, a landslide had taken out the road which would take us there. We thus took a bus as far as the road went, hiked with all the supplies (even the ones we weren´t really supposed to ever have to carry) to where the road began again and then took another bus. Later that night we bathed in hot springs. After three days of intense hiking without showers this was a relief beyong belief. On our way back to the campsite, our bus nearly got bogged in some landslide-induced mud and on our return, we were told that one of our tents had gone missing. Hmmmm… what to do? The eventual solution was that two of us would be forced to sleep in a nearby hostel for the night. Which two? Well… me and Nick, of course. We had a very good night´s sleep. The fourth day saw us cross a treacherous river in a flying fox (not all at once, mind). On the other side, we were once again confronted with the dilemma of “to truck or not to truck”. None of us did, but in the end, it became a moot point because a stretch of road very close to our lunch stop had been blocked by… you guessed it – a landslide. Unlike previous landslides in which the road had simply slid down the mountain, leaving a gap, this section of road had been covered by boulders from above which, from a distance, looked like gravel. I wondered to myself how recent this landslide was. Specifically with regard to the question of whether it was stable to cross and what the chances of me being buried much in the same way that the road had been were. We all crossed the landslide without incident and, after lunch, completed the final part of our hike along the railway tracks to Aguas Calientes, the nearest town to Machu Picchu, where hostel beds and hot showers awaited us. While walking along the railway tracks, a group of about six of us ended up being some distance ahead of the main group as we sang. (In fact, it was probably *because* of the singing that we ended up some distance ahead). Among the many highlights of our singing was the extraordinary rendition of Don McLean´s “American Pie” in which ALL the words were sung in the correct order and, mas o menos, in tune. Dinner that night was substantial (and after a substantial wait, no less) and we all hit a nightclub later that night after having a shower. Day five was no walk in the park. 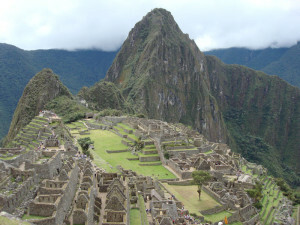 Machu Picchu, meaning “old mountain” is, surprise surprise, a mountain. Buses leave Aguas Calientes frequently to take tourists up the windy mountain pass to the visitors centre on the South side of the city. We opted to walk. That morning was particularly misty and it felt quite surreal ascending flight after flight of stairs which seemed to disappear into the fog. By now we were quite used to the altitude, but it didn´t make things any easier. We reached the visitors centre sweaty and steaming, collected our tickets and entered the site… where we couldn´t see anything. We felt quite disoriented. I looked around and all I could see was fog. I could vaguely make out what I thought was Hayuna Picchu (the mountain in the background of all the postcard shots) but could see no city. Every now and then, a gap in the mist seemed to reveal the edge of a building or two. Slowly though, the fog cleared and we found ourselves looking out over the lost city of the Incas. Wow. This was definitely one of those “pinch yourself” moments. As with Angel Falls, I had to constantly remind myself not to leave my jaw dragging along the ground for too long. Jose began taking us on the tour and telling us about the history of the place. As he did so, the fog eventually cleared completely allowing the perfect opportunity for that ultimate of tourist-traps – the group photo. We wandered into the city and had a good look around, all the while with Jose explaining things to us. After the tour was over, we had several hours of free time so I led a small expedition which included Nick, Roxana (the Peruvian) and myself to the top of Hayuna Picchu to see if we could get a better view, while the others went off to lunch. The guidebook says that Hayuna Picchu is “not for those who are afraid of heights”. At 2634m, they´re not kidding. The view from the top was expansive and the climb down was on steps so steep and so small that we resorted to climbing down them backwards for greater stability. After taking enough photos to easily be able to generate a three-dimensional reconstruction of the entire site, I finally exited the site for a late lunch. We returned to Cusco via train, where there was a bit of an “incident” where someone boarded with a stolen ticket which happened to be mine, then by bus. I clothed my feet, which by now had become quite sick of getting soaked every time I stepped in a puddle, in clean socks and sneakers which felt like walking on marshmallows after my boots. Me and Nick ate an extravagant (about 20 USD worth) alpaca-steak-with-the-lot meal before meeting up with our trekking comrades at “Mama Africa”, the quintessential gringo nightclub where even our guide, Jose, made an appearance. The next day, I departed for Puno on my way to Copacabana, Bolivia on the shores of Lake Titicaca (try making a joke out of that name, smartass!) while Nick remained in Cusco to do some volunteering work in a nearby town. Between now and June 10th, I will (hopefully) visit Paraguay, Brazil, Uruguay, Argentina and Chile but I doubt I will come across another sight quite like Machu Picchu.